Building riffs out of sand, Tamikrest have not waited long to follow up their debut album Adagh, a Quietus favourite of 2010. 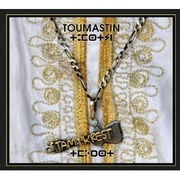 Their fully electrified African blues is of the kind we had been primed for by fellow Malian desert rockers Tinariwen, and though several bands have picked up on their leagues, it is Tamikrest who have emerged from the Sahara with the most interesting material, now explored on new album Toumastin. A deep "Ohhhh-ohh" hum and smooth guitar lick introduces the first track 'Tizarte' which, after 20 seconds, makes way into 'Fassous Tarahnet (Her Prestigious Love)'. Describing an "innocent love", lead singer Ousmane Ag Mossa intones "the earth is turning and I cross it like an illusion". And musically a new world opens up, the full band with dirty loose wah-guitar and mass female backing vocals following the leader in the mix. Dub bass and palmed djembe percussion fill out the sound; with shrill ululations punctuating in regular, but opportune moments. It's a super sound, with an effortless, yet focused groove. The lyrics are sung in their native Tuareg, but translations give weight to their message on this deep album. 'Nak Amadjar Nidounia (Me, The Stranger To Life)' drops the tempo, but does not drop in heaviness, lyrically. "I'm just a passenger of life / Which, as it come, will also take its leave," sings Mossa, before continuing his theme: "I was not created to be eternal / My life is made of illusions / In which my sadness overwhelms my joy / My heart never ceases to express / The evil I have known, which my people have lived." A melancholy song based on a stabbing guitar line, but the heat doesn't let up, building in intensity through 'Aratan N Tinariwen (Heir Of The Desert)' and into 'Ayitma Madjam (Where Are My Brothers)'. And halfway through the latter, when the flow reaches a natural conclusion, the guitars do that great trick of winding down the riff to a standstill before uncoiling it back out into the song. Pitch shifted guitars on 'Aidjan Adaky (All Things Must Pass)' evoke the atmosphere of shifting sands, as well as slicker production values reminiscent of Dire Straits, whose cassettes provided an early lesson in Western music to Tamikrest's young ears. Another instrumental begins side two, in the form of the folky acoustic 'Addektegh', breaking up the momentum, and Tamikrest pick it right up back into their own fluid riffs, as it leads into 'Tarhamanine Assinegh (To You My Love I Say)', and feelings of lost love return. Thoughts of a happier time come in 'Nak Alkaline Tinza (Tinzaouatene) (Tinza, My Homeland)', in which Mossa reflects on childhood memories of growing up in and village with his brothers. The opening bars are filtered through murky recording, as if recalling a nostalgic radio broadcast. Penultimate track 'Tidit (Reality)' calls for unity among divided brothers, acknowledging that "when you rise up, only to split up / It's the enemy you are encouraging". He calls for the Tuareg people to come together as "We have suffered too much; it's our dishonour / If you don't strive towards a clear objective". In the liner notes to this record, Mossa delivers a message to the Tuareg youth: "A people without land, like ours, who until now have always enjoyed space and freedom, inevitably suffer from this dispossession for eternity... The Tuareg want to live in freedom in their homeland and end of this form of colonisation, which has prevailed for fifty years, in other words, for far too long." The opening intro hum is reprised, leading into final track 'When The Stars Fall'. Mossa's lone guitar and voice describe listening to "the beautiful melody of the wind" as a time to reflect, to think. Searching bass lines look for harmony, as sweeping e-bowed guitars interject with a mournful solo. Mossa's closing lines on the loneliness of being without his love: "The world seems tight and narrow / When my soul sister is not here with me". The lonely wandering spirit set to continually travel desert plains in search of what? The hope of freedom somewhere over the sunset. If that could be found through music, they would already be in paradise.